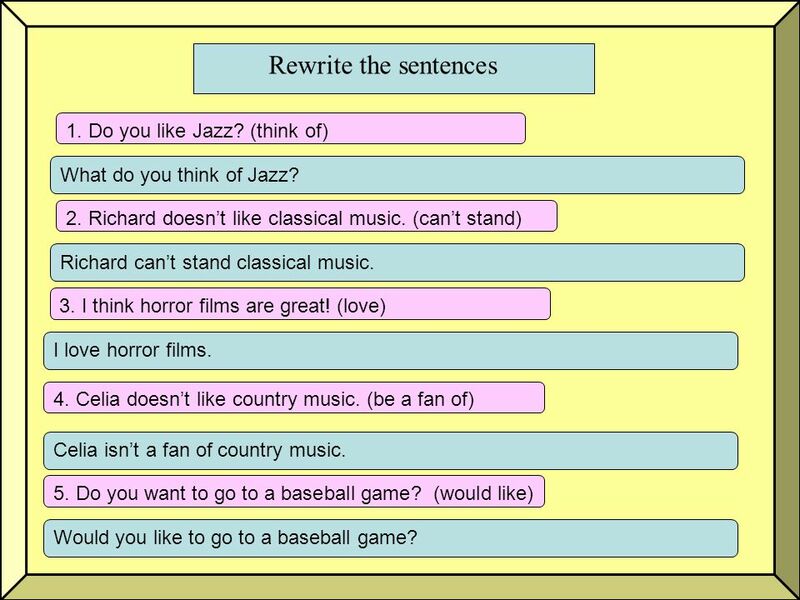 What kinds of movies A: __________________________ do you like? B: I like action movies. A:_____________ your favorite movie? What is B:My favorite movie is Avatar. What kinds of TV shows A:______________________ do you like? B: I like talk show a lot. Who is A: _________________ your favorite TV actor or actress? B: Tom Hanks is my favorite actor. 1. Which films funnier, horror films or comedies? Comedies are funnier than horror films. 2. Which movies are more interesting, musicals or science fiction films? Science fictions are more interesting than musicals. 3. Which films are scarier, horror films or thrillers? I think thrillers are scarier than horror films. 6 Which Nouns often go with these verbs? Complete the Chart. Young Ma is inviting friends to a movie. Do they accept the invitation or not? 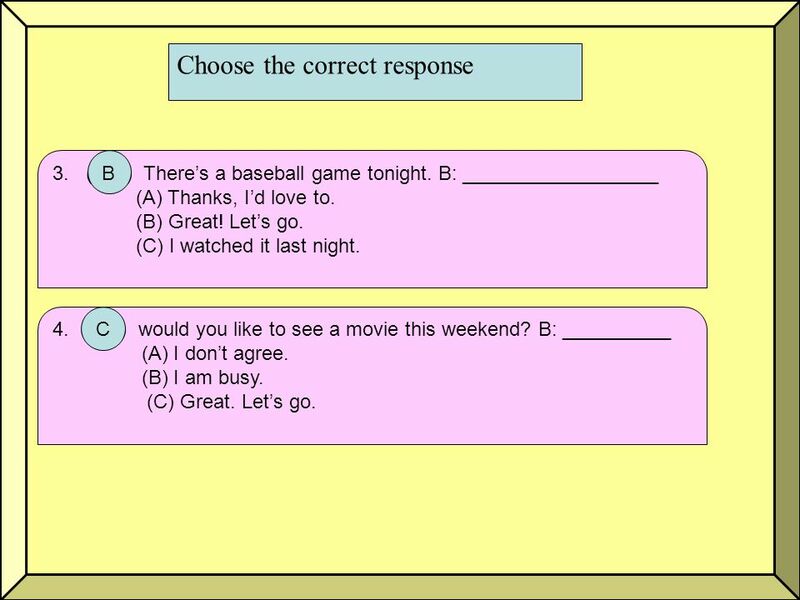 Check Yes or No for each response. Accept? Yes No 1. I’d love to. What time does it start? 2. Thanks, but I’m not a real fan of his. 3. That sounds great. Where is it? 4. I’d love to, but I have to work until midnight. 5.Thanks. I’d really like to. When do you want to meet? What do you think of Jazz? 2. Richard doesn’t like classical music. (can’t stand) Richard can’t stand classical music. 3. I think horror films are great! (love) I love horror films. 4. Celia doesn’t like country music. (be a fan of) Celia isn’t a fan of country music. 5. Do you want to go to a baseball game? (would like) Would you like to go to a baseball game? 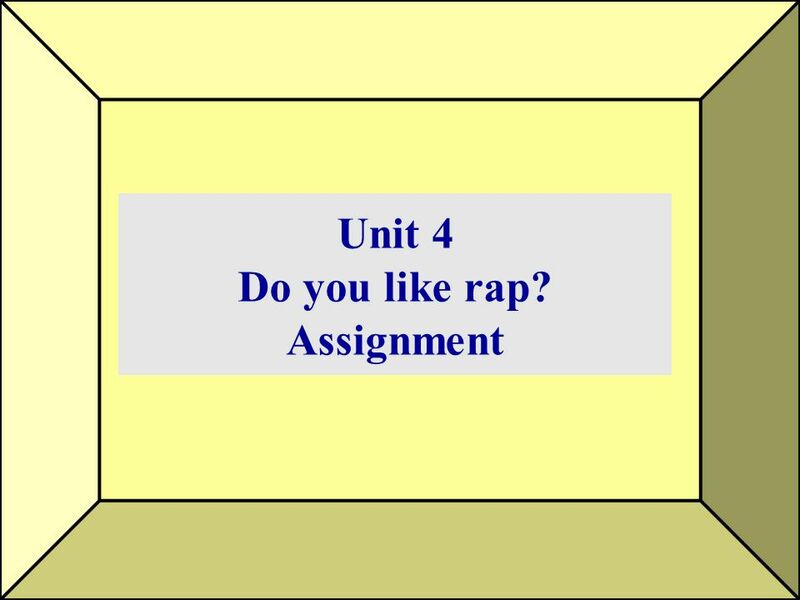 Download ppt "Unit 4 Do you like rap? Assignment"
I like music that I can dance to. 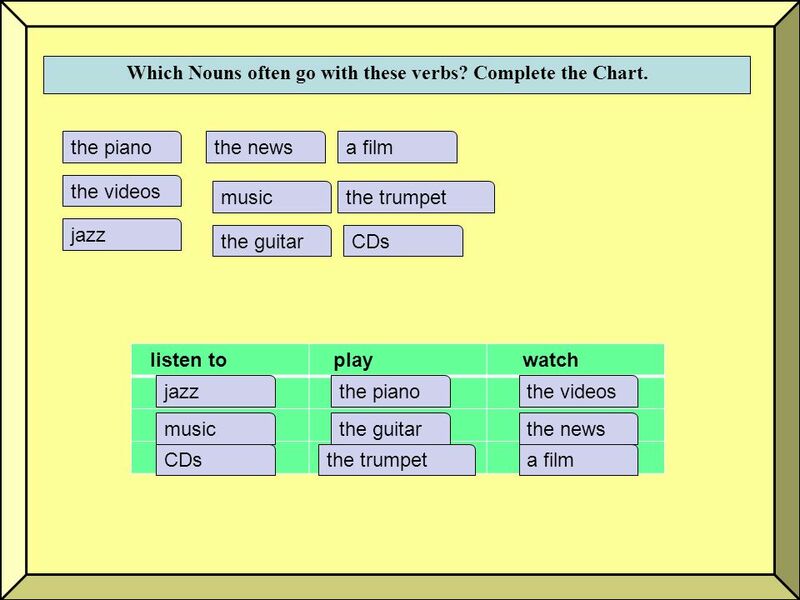 Listen to music Revision 1a---3b Do exercise The end. Unit 9 Do you want to go to a movie ? I want to go to a movie ! 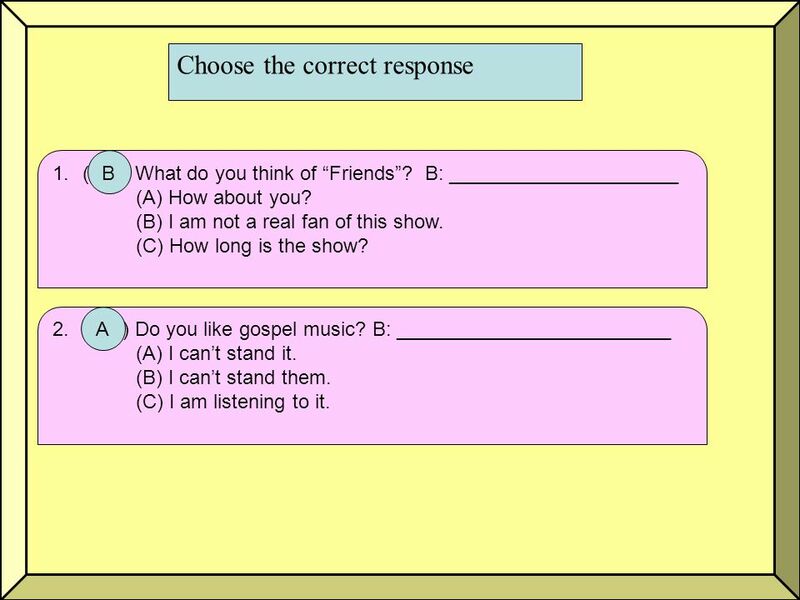 9A Unit 4 Vocabulary Types of TV programmes. Introductory “it” The Warehouse Madrid Advanced Course. Conversation Skills: Keep it Going. 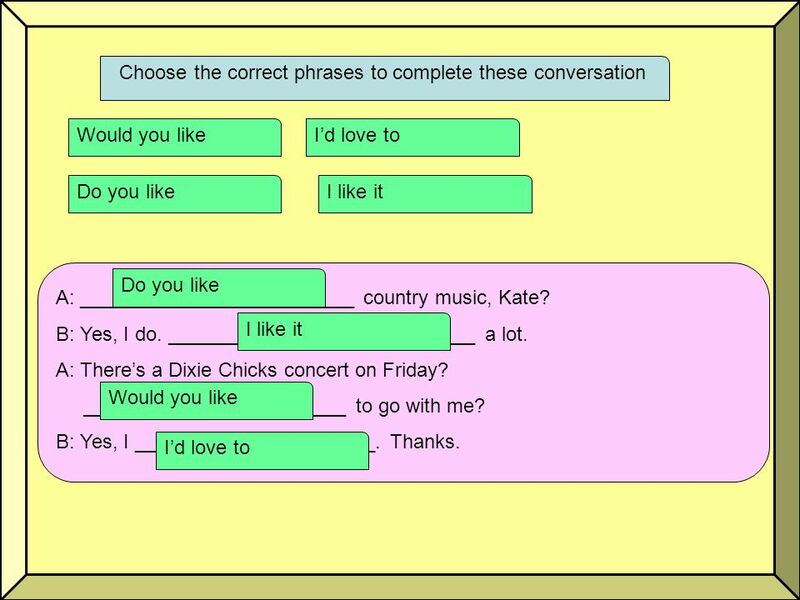 Ways to Respond in a Conversation: WITH FEEDBACK QUESTIONS ANSWERS.